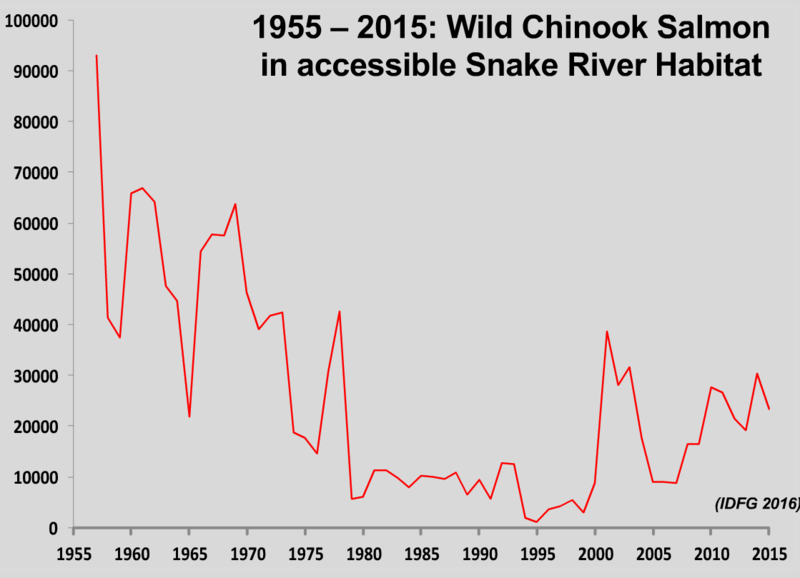 The drop in Chinook salmon abundance due to lower Snake River dam construction (1962 – 1975) is very apparent. 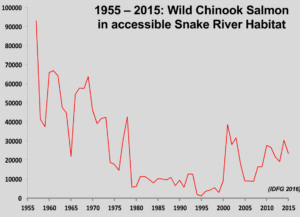 The number of wild Snake River adult spring/summer chinook, measured as a percentage of juveniles that left the river and returned as adults (smolt-to-adult returns or SARs), has declined four-fold since the early 1960s and since the four lower Snake River dams were built, according to a report produced by the Fish Passage Center. In its annual draft Comparative Survival Study, the FPC found that SARs for the wild chinook had fallen from 4.3 percent in the early 1960s to 1.0 percent during the period 1994 – 1999, and since the year 2000 SARs has been at 1.1 percent. The FPC released the Bonneville Power Administration-funded report in late August and is asking for comments from fisheries managers and the public by October 15. The final CSS is scheduled for completion by the end of December. The study also determined that SARs for Snake River wild steelhead declined nearly four-fold from the 1960s from 7.2 percent (1964 to 1969) to 1.9 percent (1990 to 1999) and 2.5 percent during the 2000 to 2014 period. Ice Harbor Dam, the lowest of the four dams on the Snake River, was completed in 1961, Lower Monumental in 1969, Little Goose in 1970 and Lower Granite in 1975. In addition, the John Day Dam, a lower Columbia River dam that’s shoe-horned between McNary Dam upstream and The Dalles Dam downstream, was completed in 1968. “Overall PIT-tag SARs for Snake River wild spring/summer Chinook and wild steelhead fell well short of the Northwest Power and Conservation Council (NPCC) SAR objectives of a 4 percent average for recovery and 2 percent minimum,” the CSS concluded. The SAR objectives for wild fish from the Snake River system are contained in the Council’s 2014 Fish and Wildlife Program. The Council objective of 2 percent has been achieved in only two migration years for Snake River wild spring/summer chinook from 1994 through 2015. Those years were 1999 and 2008, the CSS report says. The mean for all stocks is 0.84 percent. For all spring/summer chinook stocks, SARs were highest in 2008 and were very low in 2006, 2011, 2014 and 2015. The reintroduced and also unlisted Clearwater River chinook SAR was lower at a mean of 0.53 percent than other Snake River spring/summer chinook stocks. The estimated overall SARs for Snake River hatchery spring and summer Chinook varied by hatchery and year. In general, the two hatchery summer chinook populations had higher SARs than the hatchery spring chinook populations. — Clearwater Hatchery spring and summer chinook, Sawtooth Hatchery spring chinook and Pahsimeroi Hatchery summer chinook varied by year within a range generally similar to other CSS hatchery chinook groups, the report says. However, SARs for Pahsimeroi Hatchery summer chinook were very low in 2014-2015. The mean SAR for wild Snake River steelhead during the period 1997 to 2014 was 1.6 percent, and exceeded the Council’s 2 percent objective in eight of the 18 migration years. The mean SAR during 2006 to 2014 for the wild A-run group of steelhead (smaller than 28 inches in length) was 2.12 percent, about 32 percent higher than the wild B-run of steelhead at 1.6 percent. Snake River hatchery steelhead had overall lower SARs than their wild counterparts. Overall, hatchery steelhead SARs were 1.27 percent and significantly exceeded 2 percent only in 2008. Overall SARs were higher for A-run hatchery steelhead than for B-run hatchery steelhead in the years 2008 to 2014, and SARs of Clearwater River hatchery B-run exceeded those from the Salmon River. “Overall SARs of Snake River wild spring/summer chinook and steelhead are the net effect of SARs for the different routes of in-river passage and juvenile transportation. None of the passage routes have resulted in SARs that met the NPCC SAR objectives for either species. The relative effectiveness of transportation has been observed to decline as in-river conditions and survival rates improve,” the study concludes. SARs of Snake River hatchery sockeye varied by year and hatchery group during smolt migration years 2009–2015. SARs for Sawtooth sockeye ranged from 0.10 percent to 1.15 percent in the years 2009 through 2015, whereas Oxbow sockeye SARs ranged from 0.39 percent to 2.26 percent (2009–2012). The 2015 SAR for Springfield Hatchery sockeye was 0.0 percent. The inclusion of fall chinook salmon is a work in progress, the CSS says. That’s because it wasn’t until 2010 that the CSS oversight committee received a request to begin their inclusion. Working with the Nez Perce Tribe, the CSS funded PIT-tag marking in 2015. Some 40,400 subyearling fall chinook were tagged that year. In 2016, 50,000 were tagged and 60,000 were tagged this year. Although migration information existed prior to these PIT-tag releases, future survival estimates will benefit from the tagged fish. “As a pilot effort, its scope is limited, but will provide some level of information for an entire ESU that currently has no comprehensive marking program to evaluate the effects of transportation on adult return rates,” the CSS says. Overall SARs to Lower Granite Dam (excluding jacks) for Snake River hatchery subyearling fall chinook were low in three of the seven years analyzed, the report says. Fall chinook overall SARs ranged from 0.12 percent to 0.56 percent for hatchery releases in 2006 and 0.0 percent to 0.3 percent in 2007. The highest SARs were observed for migration years 2008 and 2011 when SARs ranged from 0.30 percent to 1.07 percent. SARs for 2009 were relatively low as well, with SARs ranging from 0.05 percent to 0.23 percent. For the 2010 migration year, SARs were between the low returns from 2009 and the highest returns from 2008. SARs for 2010 ranged from 0.20 percent to 0.97 percent. For migration year 2012 SARs ranged from 0.40 percent and 0.79 percent. The “Comparative Survival Study of PIT-tagged Spring/Summer/Fall Chinook, Summer Steelhead, and Sockeye DRAFT 2017 Annual Report,” can be found at http://www.fpc.org/documents/CSS/DRAFT2017CSS.pdf. Comments should be sent by October 15 to Michelle DeHart at mdehart@fpc.org. The study’s project leader is the FPC’s DeHart, but the report is compiled by the Comparative Survival Study Oversight Committee and the Fish Passage Center. Contributors include Jerry McCann, Brandon Chockley, Erin Cooper and Bobby Hsu of the FPC; Howard Schaller and Steve Haeseker are from the U.S. Fish and Wildlife Service; Robert Lessard is with the Columbia River InterTribal Fish Commission; Charlie Petrosky is from the Idaho Department of Fish and Game; Eric Tinus, Erick Van Dyke and Adam Storch are from the Oregon Department of Fish and Wildlife; and Dan Rawding is with the Washington Department of Fish and Wildlife.